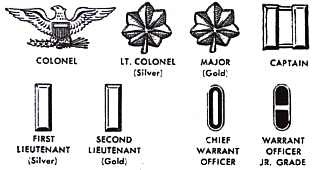 Enlisted WAC personnel wore the grade insignia (in the same manner as prescribed for enlisted men of the Army) on both sleeves of their overcoats, utility coats, jackets (wool field and service), shirtwaists and additionally on WAC off-duty dresses. ..... Enlisted Women were authorized to wear a service stripe for each period of 3 years Federal Service, under the same regulation as apllied to enlisted men. Service of enlisted women in the Women's Army Auxiliary Corps (WAAC) was counted in computing the 3-year period required to establish eligibility. 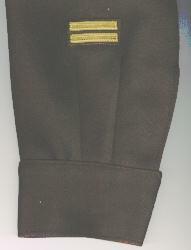 Left: Sleeve of an enlisted woman's uniform with one diagonal service stripe and three overseas stripes sewn above. 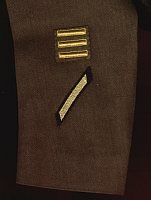 WAC personnel could wear gold stripes on the lower left sleeve of their service jacket. Each stripe indicated a 6 months period of serving overseas. 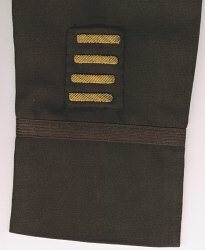 WAAC and WAC personnel could wear a sleeve patch on their left upper sleeve of their service and field jacktes, overcoats, utility coats, raincoats and waists to indicate the Army force to which they were assigned. The Army was divided in three forces, the Army Service Force, the Army Air Force and the Army Ground Force. 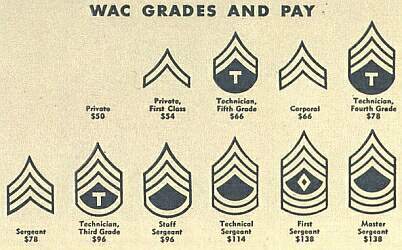 Only very few WAACs/WACs served with the Army Ground Forces. The patch could be that of a General Headquarters or a special higher-level formation or command. China-Burma-India (CBI) Headquarters: . The original mission of the China-Burma-India (CBI) Headquarters was to increase the effectiveness of U.S. assistance to China and to assist in improving the efficiency of the Chinese Army. The design of the presented patch had been in use since 1942 but was not officially approved before November 1944. ETOUSA (Headquarters, European Theater of Operations, United States Army): The ETOUSA prepared and carried on operations in the ETO against the Axis powers and their allies under strategical directives of the combined U.S.-British Chiefs of Staff. After formation of the SHAEF in February 1944 the ETOUSA became primarily responsible for the administration and supply of U.S. troops. The first design patch was approved in September 1943. Due to the change of task a revised design adopting the Army Service Forces insignia was approved in February 1944. SHAEF (Supreme Headquarters, Allied Expeditionary Force): The primary mission of the SHAEF (Supreme Headquarters, Allied Expeditionary Force) was to enter the continent of Europe and in conjunction with the other United Nations, undertake operations aimed at Germany and the destruction of her armed forces. If you search for more information and more examples of U.S. Army soulder sleeve insignia take a look at this great homepage compiled by Dr. Howard G. Lanham: http://www.angelfire.com/md2/patches/branchI.html .